1. Cook the beans in a large pan of boiling water for 2 minutes until tender. Drain then cool under running water. 2. Stir together the lime juice and sweet chilli sauce. 3. Mix together the steak, oil and curry paste until the meat is evenly coated. Heat a wok or large frying pan and stir-fry the steak over a high heat for 3 minutes until nicely browned. 4. 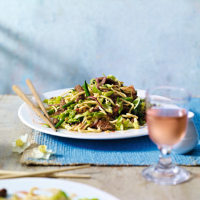 Toss together the cooked beans, noodles, lettuce, red onion and sweet chilli dressing. Stir through the cooked steak and scatter with herbs before serving swiftly. If preparing this ahead, allow the steak to cool before stirring into the salad. Perfect for lunch boxes.